Using a Canon with liveview as a huge webcam ! Recent images with this technic ! I am very excited using such a large sensor as a webcam ! FOV is immense ! It is the about half the field of full frame camera with a TSC 8" ! 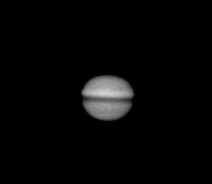 I just have to move the white rectangle on it and then use the 5X zoom without touching to the telescope ! 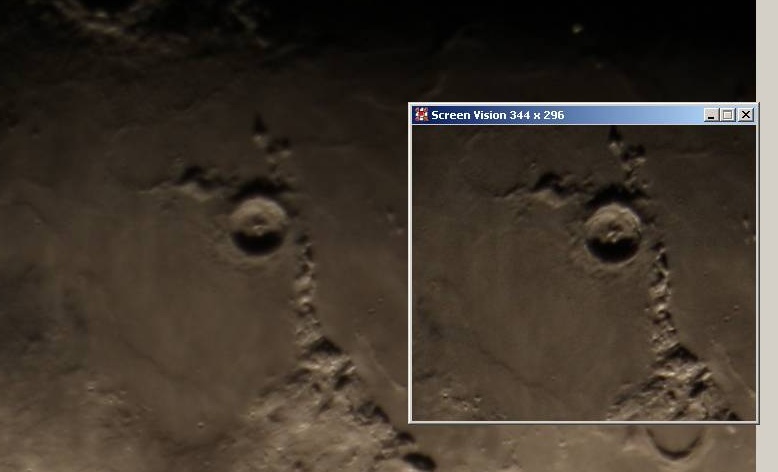 Moreover, our Screen Vision software will help me to get a very precise focus ! In my case it is my Canon 40D* but it could be another one 1000D, 450D, 500D, 50D, 7D*** ... you just need Liveview ! Of course the best for size, speed, would be with a 5D MarkII ! You are a lucky guy if you have one ! Note : I did not develop nor have actually any special access to the development of this software !! In that case you may use this image as a custom WB picture and this one if you have a LPS filter in line ! 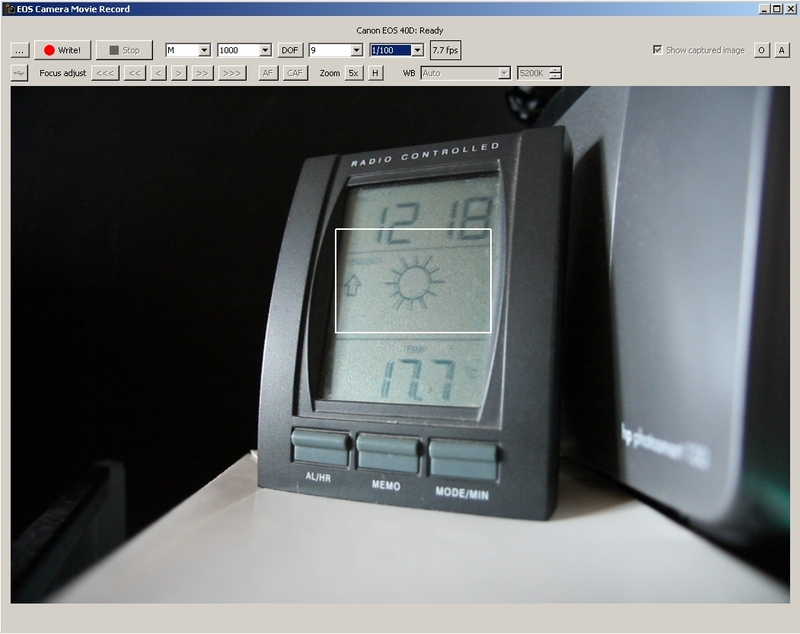 I experiment with this software, more or less disconnexion with the camera with a 6m long USB2 wire. Canon utilities does never do that in the same conditions even connected for hours ! It is the main problem I have. If it happens to you, you have to disconnect the USB2 cable, eventually change from USB port, turn off the camera ...If you put live video on the screen of the camera, then after a few min it will turn off and kill the connexion at the same time. Then be sure you don't face this kind of problem before attempting critical captures (eclipses or else) ! 3) Choose a folder and name for your AVI ! Note : if an AVI name already exists, the next one will have a generic incremented name. Wao ! Capture speed jumps to more than 22fps (I have seen almost 30fps sometimes) * !!! click WRITE ... recording start ... you may stop it at any time. NOTE : After 30 min the Canon 40D will reset the liveview and EOSmovrec will freeze ! don't leave you PC unattended for more than about 25min to be able to stop AVI recording, close and restart EOSmovrec before this happens ! The incredible liveview 5X ZOOM captures !! Note : 10x does not work but it is not important as with 5x we are already at the pixel level ! If you click write while the 5X ZOOM is ON, you will record what is seen on the screen with the 5X ZOOM and not the full frame !! 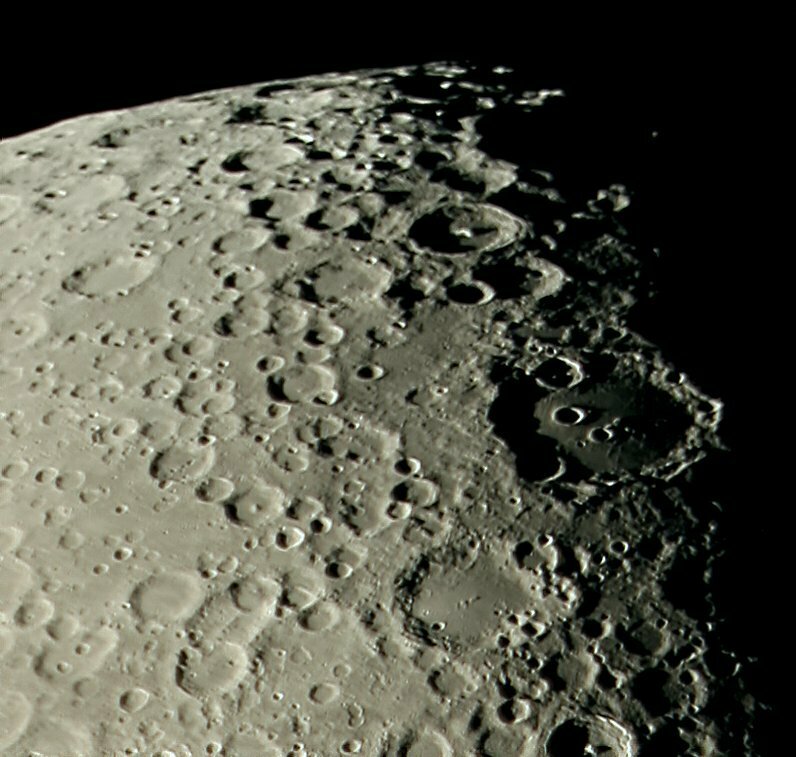 and what is absolutely incredible is that it is not an usual digital zoom ... it is a software resize of the sensor (like the one on recent Panasonic cameras) ! The resulting image is the image you would obtain with a CMOS with sizes 5X smaller and with no resolution lost ! 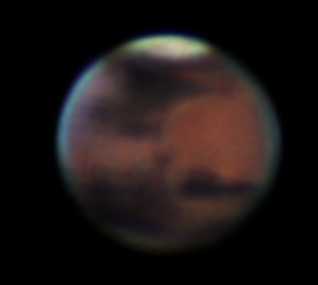 than the one obtained without zoom and latter magnified 5X by a good processing software ! This is much better than a webcam and can compete with a DMK or a Lumenera. Remember that the Canon 40D and other Canon EOS have a dynamic of 14 bits at the sensor digitalisation level ! Moreover, you can place the region of interest anywhere you want before going to liveview zoom ! Then you get the best of two worlds : a large FOV to easily find what you want & then a high resolution on a selected part ! Such features are for me incredible news ! I shows in live XVID video the zone inside Screen Vision. click on image to see/download it. for moves or tracking looking at its LCD. I like this ! You can also choose to look at a video monitor connected with the video cable instead. min, connexion with EOS_movrec and recordings will stop ! Note : Test the quality of the saved AVI (luminosity ...) before starting a full night of captures ! It may happen that your movies are still overexposed even when changing the ISO or Exposure on the EOS-movrec ! 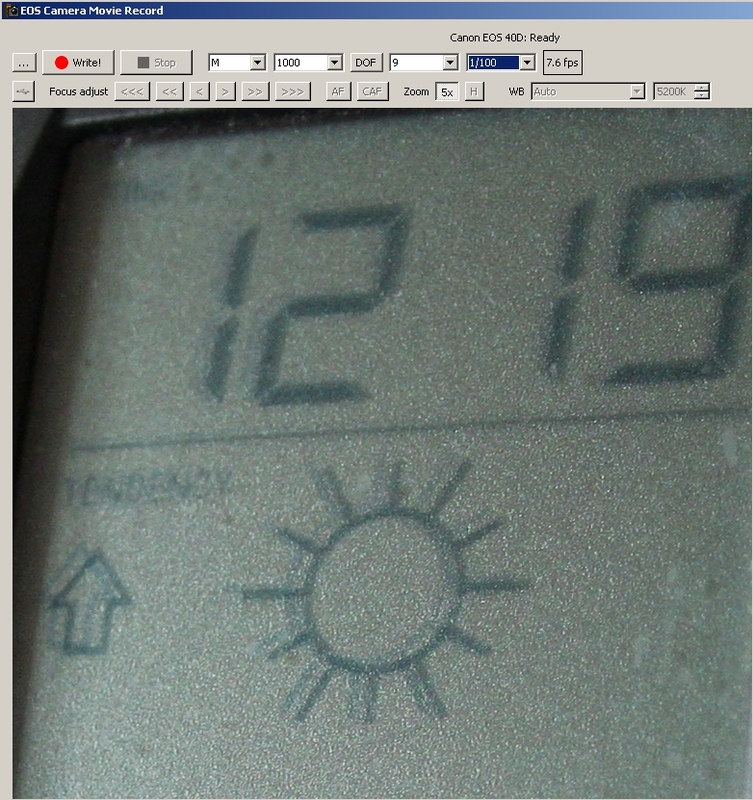 The solution is to set "simulated liveview" in the custom functions of the setup menu of you Canon EOS. 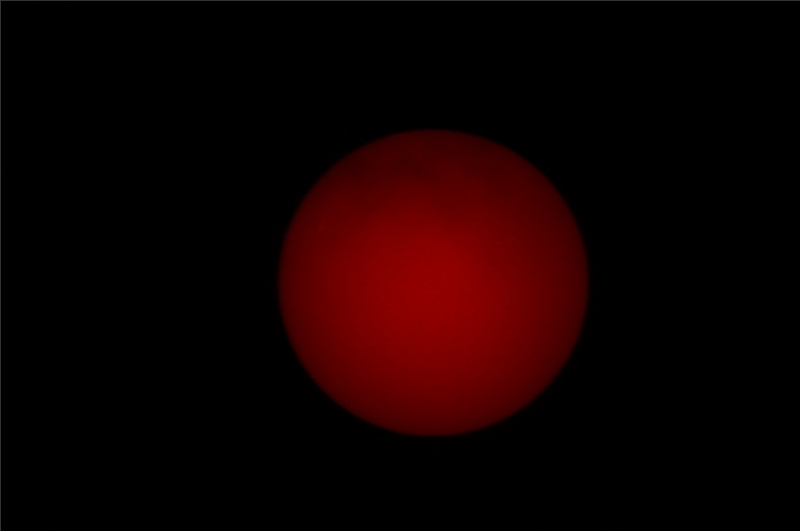 2- Liveview in simulated mode : exposure is good, details are seen in live enhanced here and colorized (3). You can download larger image (right click). Issue in Registax 5 ! "Failed to start AVI decompression : codec:MJPGvids"
1. First ensure you have downloaded and installed the latest version of Microsoft's Directx application program, then reboot your PC. 2. After rebooting your PC look for one of the Movrec AVI's that you had problems with. Click on the AVI to run it with Windows Media Player. Windows should ask you then to finalize the installation. 3. Restart Registax5. Look for the "Extended Mode" and the "Use Extended mode for" control button bars. Click on the "Default" button in the "Extended Mode" bar. In the "Use Extended mode for" bar, click on the "always" button. 4. With the above buttons set, then attempt to load the Movrec AVI's. As you "click" on a file, it should be read okay, and a thumbnail should appear on the right with some data on the AVI file above it. The file should then load successfully into RegiStax. 5. The above instructions should allow you to load the Movrec AVI's. If you are still having problems, you may want to try "clicking" on other permutations of the buttons described above. Focusing with the help of ScreenVision at the start of each AVI. Capture while in 5X zoom ! Capture at about 20-25 fps. 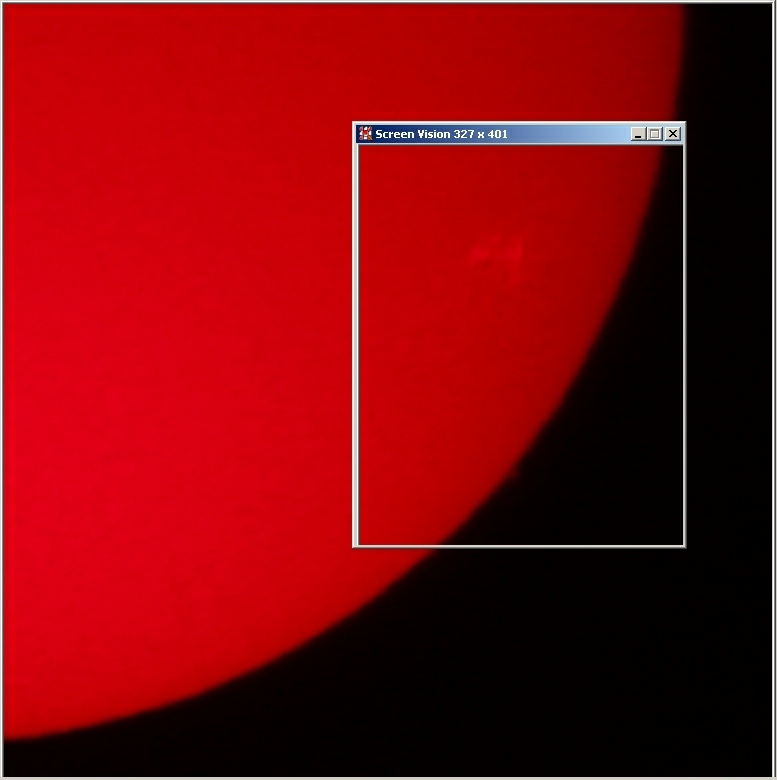 This picture in the result of a registration of 1000 frames (see below) by RegiStax5. 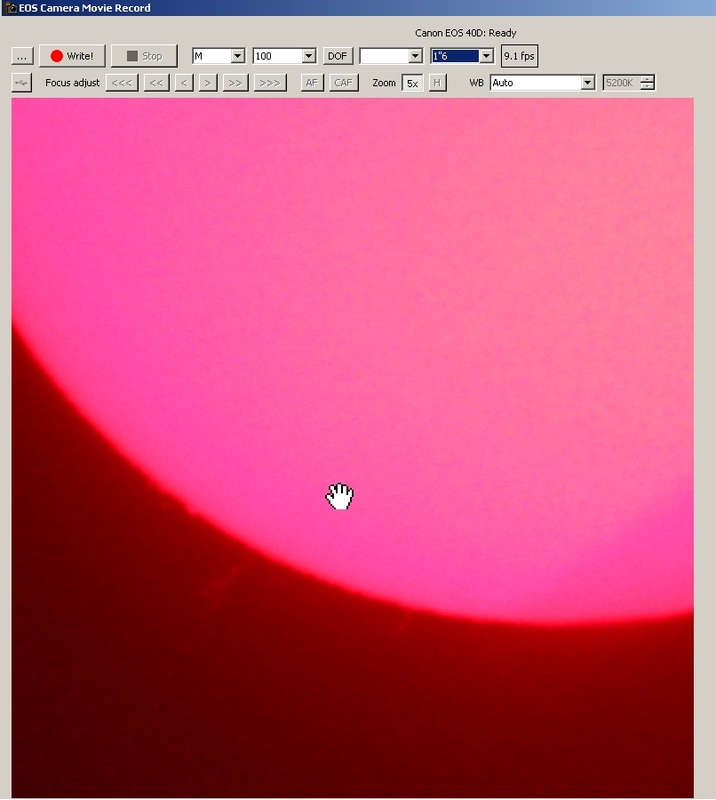 This picture in the result of a registration of 1800 images by RegiStax5. Capture at about 22 fps. 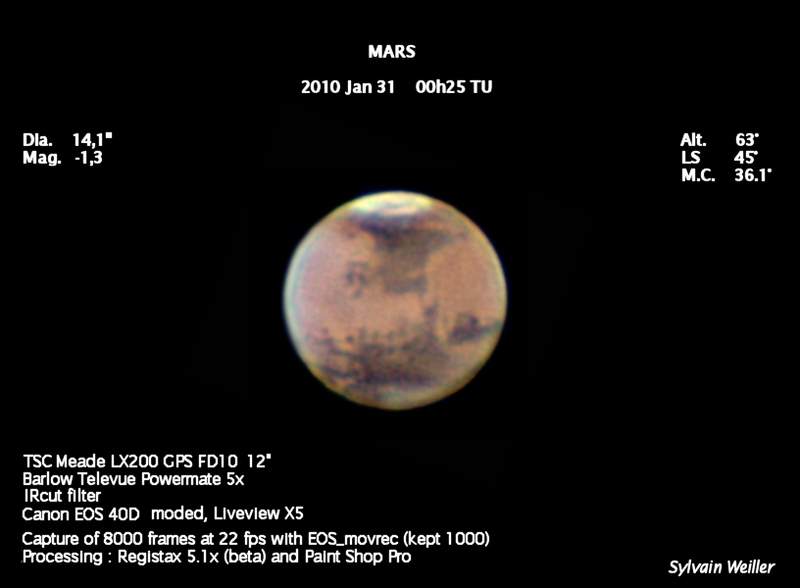 Mars in december 2009, Mars is still looking very small (less than 7") even in a 10" SCT ! 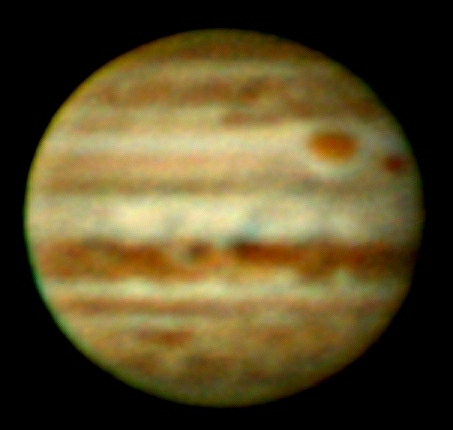 This picture in the result of a registration of 364 images out of 1458 of the AVI by RegiStax5. Even small, the quality is really there and many details are visible. It is remarquable that this blue layer is noise free compared to a usual webcam (here zoom 2x) !! 2- With this setup at 10m focal length I am not far from the same FOV as with a commun webcam at 2m focal length ! 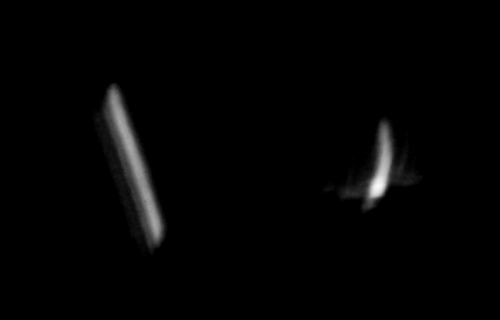 because these parts had much less captured images for stacking and showed more noise and multipoint alignment artifacts. 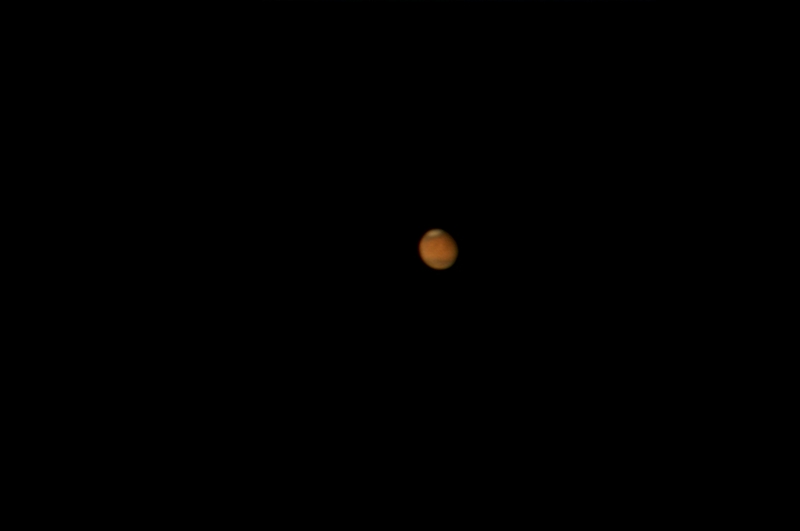 and Mars captured at the same time on the PC (but black screen to have 25 fps capture speed) ! 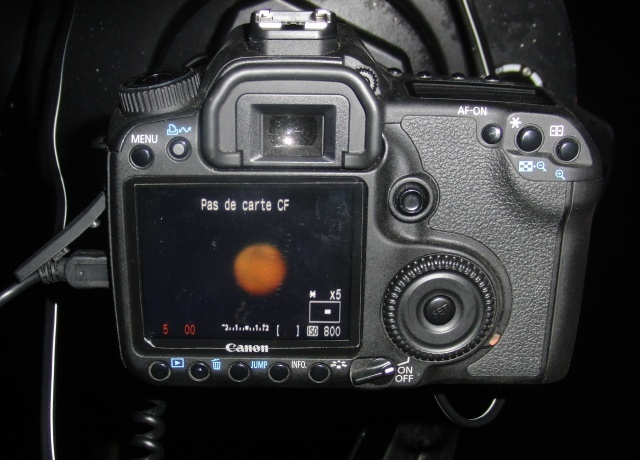 Here is the view at the Canon with Mars dancing live and so much details visible ... and also at right the resulting image after Registax5 ! 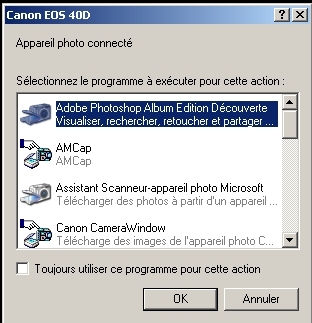 *All values shown for Canon EOS 40D. Will differ in better or worse for other models. 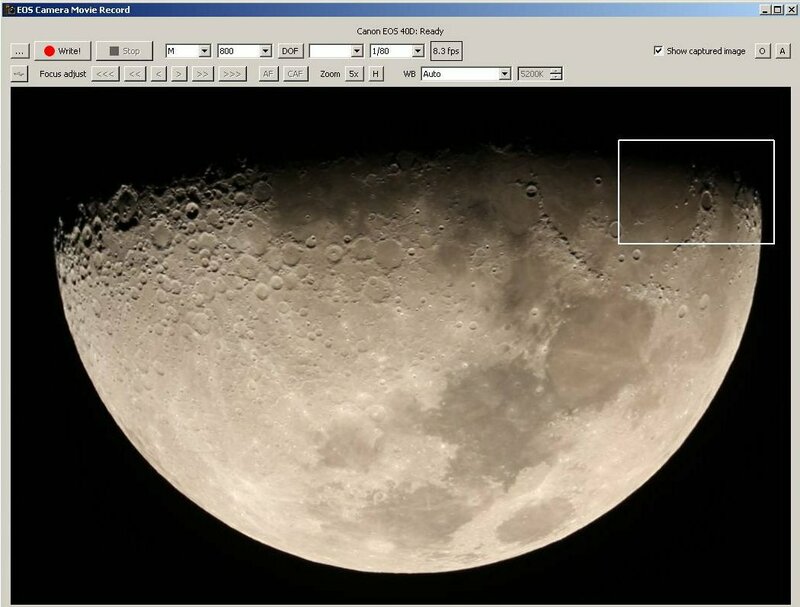 Search for ISS presence and recentering : RegiStax5 gravity mode. Best image ! 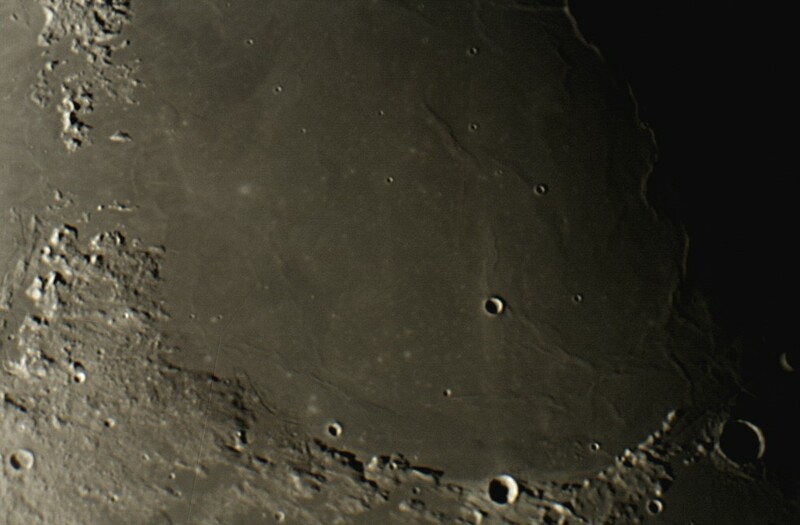 Gif animation in real size :) Conclusion : use a barlow to obtain about 6m focal length ! Got larger but blurred images. 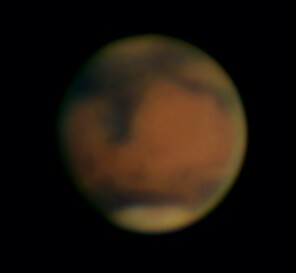 Next time I should try >= 1/1600s exposure especially if Mag >-2 ! 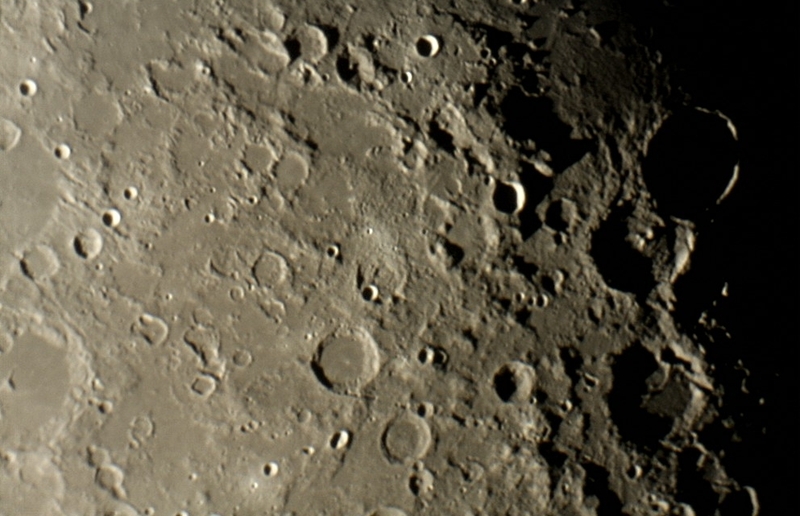 Movrec & Registax sur 1900 frames. 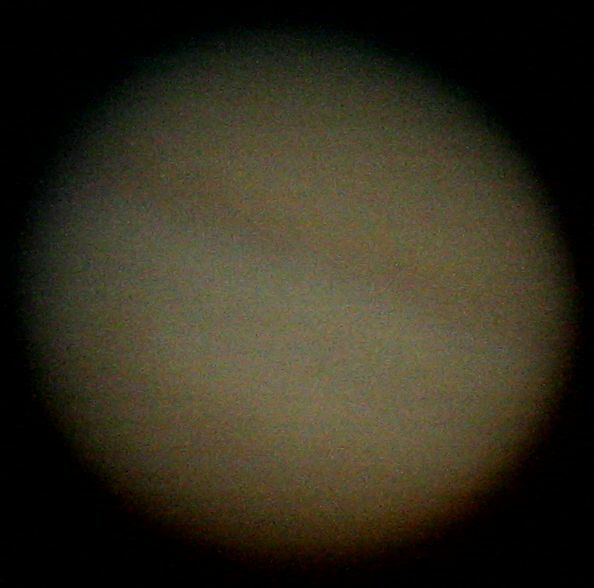 Not enough sensitivity to capture the thin rings but the disk is nice ! Jupiter should give sone better results.